The Knights of Columbus are a Catholic fraternal organization that believes in charity, unity, giving back to the community and living in accordance with the word of Christ. They have chapters all over the world, including an excellent chapter in Kankakee. The Kankakee chapter of the Knights of Columbus host events such as bingo nights, and also rent out there event space. This space is great for birthday parties, reunions, wedding showers and more. 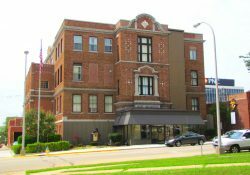 The Knights of Columbus Kankakee chapter also has office spaces that are available for rent close to the Kankakee County Court House. Membership to the Knights of Columbus involves approval, and then an initiation. There are also initiation fees and membership dues. Once you are a member, you become a member of a brotherhood of Catholic men united by faith and love. If you are interested in membership, make sure to put in an application with the local council in your area. Booking Howl2GO Dueling Pianos’ world class show to your Kankakee, IL event couldn’t be simpler. From conventions to corporate events, weddings to fundraisers, our unbeatable Dueling Piano shows bring a high energy, interactive show that your guests will remember for years to come anywhere in Illinois!